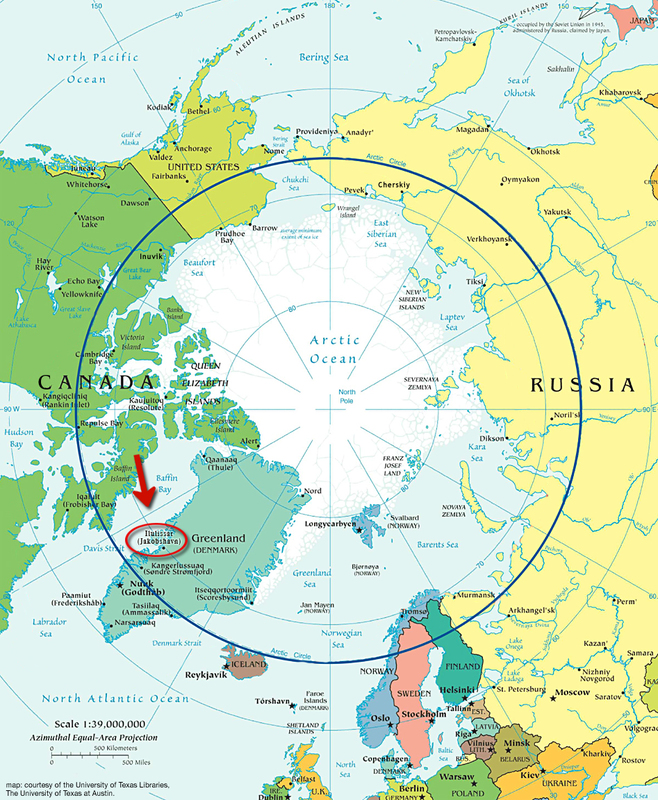 ILULISSAT, GREENLAND– Here’s your bit o’ science jargon for the day: cryoconite. 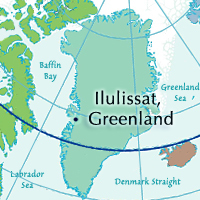 It’s a word I encountered in the Dry Valleys of Antarctica seven years ago and had forgotten about until the other day when I encountered cryoconites of top of the Jacobshavn glacier near Ilulissat. 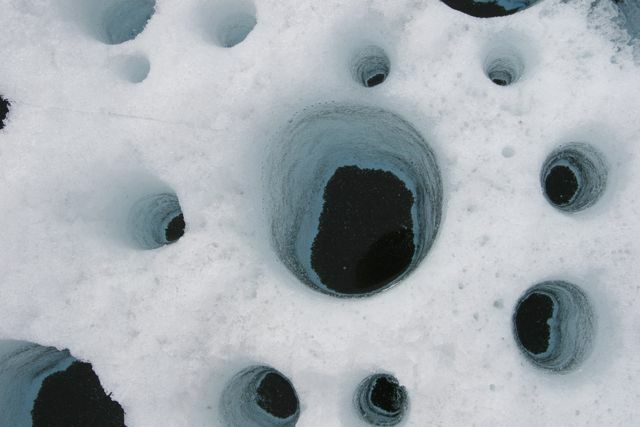 Essentially they are small round pools of water on the top of a glacier that have a layer of dirt on the bottom. But here’s the amazing thing about cryoconites: they harbor a complete ecosystem with single-celled photosynthetic bacteria and algae that are eaten by tiny nematodes, rotifers, and tardigrades (“water bears”) that are, in turn, eaten by carnivorous tardigrades. A cryoconite we found atop the Jacobshavn glacier. I knew that about Antarctic cryoconites, but I wasn’t sure about the Arctic variety so we searched out a bookstore in Ilulissat today and I looked it up in the “Ecology of Greenland.” Sure enough, this textbook, published in 2001 in English, Danish and Greenlandic, answered my question: the little melt-holes on ice contain six species of tardigrades. 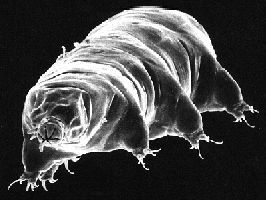 The most common, Diphascon recameri, can be found in abundance; one study counted 367 water bears in a 10 ml sample found on the Jakobshavn glacier. Tardigrades have even been found 80 meters below the surface happily making a living in cryoconite dust that washes down deep ice crevices. A typical species of tartigrades. The cryoconites themselves start when a bit of wind-blown dust containing these hardy organisms lands on the ice. The dark color of the dust absorbs more of the sun’s energy than white ice and melts a hole in the ice sheet. 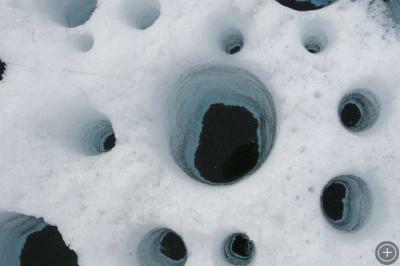 The holes can reach a depth of 20 cm and we saw hundreds of these little aquaria everywhere we walked on the ice. On a summer day, even though the surrounding ice is below freezing, the temperature of the dust at the bottom of a cryoconite can reach 6 degrees C, a cozy environment for its inhabitants. Multiple cryoconites on the Jacobshavn glacier. 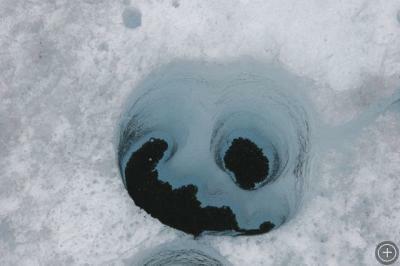 Isn’t life amazing that it can even eke it out on top of an ice sheet? Wonderful! And those little “ice bears”, wow, they really look like bears, albeit with two extra legs. Tardigrades are really wonderful creatures, found all over the world in extreme environments including the Dry Valleys of Antarctica. Glad you enjoyed this post about them.